Legacy Classic is truly a benchmark when it comes to the American furniture industry. Well respected for their quality, outstanding design and commitment to safety, they have been providing top of the line interior design solutions for homes since th View more e late 90’s. Born out the bond between three friends and their desire for quality and accountability, the company has now branched out to include celebrity collections and their award-winning Legacy Classic Kids Collections. Nowhere is safety more important and fun more crucial than when it comes to our children’s bedrooms, and no one manages to make this combination work better than Legacy Classic Kids. 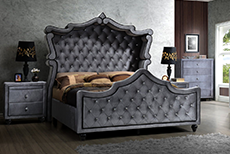 Legacy Classic is truly a benchmark when it comes to the American furniture industry. Well respected for their quality, outstanding design and commitm View more ent to safety, they have been providing top of the line interior design solutions for homes since the late 90’s. Born out the bond between three friends and their desire for quality and accountability, the company has now branched out to include celebrity collections and their award-winning Legacy Classic Kids Collections. Nowhere is safety more important and fun more crucial than when it comes to our children’s bedrooms, and no one manages to make this combination work better than Legacy Classic Kids.